Local Jobs created – CareerFit is here to help you! Over the past months our Employment Specialists have seen an increase in our clients’ success in getting jobs. This is very good news! Since January 2012 we have been able to place 50 skilled candidates in jobs, impacting their lives tremendously and contributing to their family stability. Also more than 60 candidates have each had at least two job interviews, demonstrating that our program provides excellent tools to compete in the current job market. Locally we have seen economic progress and certainly this summer there are a lot of new employment opportunities. The Portland-Milwaukie Light Rail Transit Project has been essential to the current and long-term economic vitality of our Portland Metro communities, not only because in the future it will help to connect people to their jobs and higher education but also because it is providing many short-term benefits for the regional economy by creating new job opportunities. On June 11, 2012, the project contractors reported that 1,525 construction jobs were created! 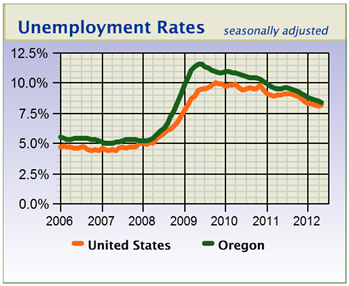 Comparing the current Oregon Unemployment rate at 8.4%, with the rate in 2011, we can notice a 1.1% decline (from May 2011 to May 2012). Construction was one of the industries most affected during the recession and just as the broad sector lost jobs, so did the subsector focused on building the state’s infrastructure (heavy and civil engineering construction). Job counts are still well below pre-recession levels, but the industry began to rebound locally and state wide. I like this quote from Bruce Lee: “The future looks extremely bright indeed, with lots of possibilities ahead — big possibilities. Like the song says, we’ve just begun.” Our Employment Specialists can help you gain the confidence and tools you need to be competitive in the current job market; we help you discover your strengths and applicable skills from past experiences. For more information about our FREE Individualized Employment Assistance Program, call 503-546-6377. Here at Northwest Family Services- 6200 SE King Road Portland OR 97222.